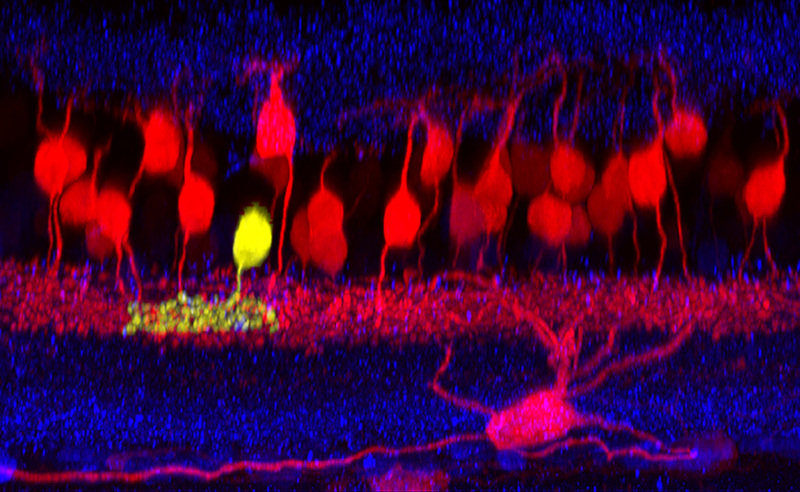 3-D reconstruction of a GluMI retina neuron at the ultrastructural level showing its input (magenta puncta) and output (yellow puncta). The image was obtained with serial block face scanning electron microscopy. Rachel Wong, UW professor of biological structure, and Luca Della Santina, former postdoc in her lab, said the GluMI “cell dragged us around” as they tried to unlock its mystery. Neurons are nerve cell involved in receiving or sending signals. The new cell, which the UW Medicine researchers conducting the research named GluMI (pronounced “gloomy”) acts like one class of neurons, but anatomically resembles another. The discovery is bound to excite vision researchers, said Luca Della Santina, one of the study’s co-lead authors and a former postdoctoral student in the University of Washington Department of Biological Structure. “This cell represents not just a new kind of neuron but a new way to convey information within the retina,” he said. The researchers detailed their findings in a paper, “Glutamatergic monopolar interneurons provide a novel pathway of excitation in the mouse retina,” published Aug. 8, in Current Biology. They scientists didn’t expect to find a new type of cell, Della Santina said. This part of the retina has been well-mapped. For the past 100 or so years scientists have placed retinal interneurons squarely into one of two boxes. Bipolar neurons relay information from the retina’s photoreceptors, which capture light, to the specialized cells that process those signals into vision for the brain, called ganglion cells. Monopolar neurons, on the other hand, typically aren’t contacted directly by photoreceptors. They also provide inhibition, meaning they hit the brakes to keep nerve cell signaling traffic in check. But the GluMI cell is an oddity. Its structure clearly is monopolar, yet it functions like a bipolar cell by exciting the ganglion cells. Della Santina first noticed the GluMIs in 2010, while studying the retina of transgenic mice. These animals were engineered to manufacture a fluorescent protein to help illuminate different cells in different colors. He observed a cell type that looked monopolar but, puzzlingly, didn’t have any of the markers of an inhibitory retinal cell. He set his finding aside while he finished his original research. A team at UW Medicine, including Rachel Wong, Sidney Kuo, Takeshi Yoshimatsu, and Fred Rieke, as well as a researcher at the University of Tokyo, then got together to solve the cellular conundrum. They turned first to its appearance. Under a microscope the GluMI cells seemed to have synaptic ribbons—a hallmark of bipolar cells. Yet the researchers weren’t 100 percent certain. They got a helping hand from a relatively new imaging method called serial block-face electron microscopy, which is a way to generate high-resolution, 3-dimensional images from biological samples. This powerful microscope zooms in to reveal a cell’s ultrastructure at nanometer resolution. A nanometer is very roughly about one million times smaller than the circumference of a ballpoint pen tip. The 3-D images they created confirmed that GluMI had synaptic ribbons. Once they understood the structure, the researchers turned to function. Sid Kuo, a postdoctoral fellow with Fred Rieke, confirmed that the cell was relaying light information and showed that its light responses differed from those of bipolar cells. But since the cell wasn’t contacted by the photoreceptors, the source of these light responses was a mystery. It still is. After debating what to call their new cell, they decided to name it a glutamatergic monopolar interneuron, or GluMI. The “gloomy” cell was not named after the Seattle weather, quipped Wong, a UW professor of biological structure. Although they didn’t intend to find it, the UW team looks forward to exploring the role of the GluMI cell in visual function, in conjunction with their research colleagues around the world, she added. This research was supported in part through NIH R01 grants EY017101, EY11850, and EY01730.